Iran striker Azmoun set up Mehdi Taremi for and 18th-minute opener and scored one of his own after the half-hour mark, before substitute Karim Ansarifard's strike in the first minute of second-half stoppage time guaranteed a last-four clash with Japan on Monday. China failed to heed the warning after surviving an early scare when Azmoun's header was cleared in front of goal by Zheng Zhi, the striker capitalising after Feng Xiaoting let a long ball bounce to tee up Taremi for a simple finish – his third goal in as many matches at Mohammed Bin Zayed Stadium. 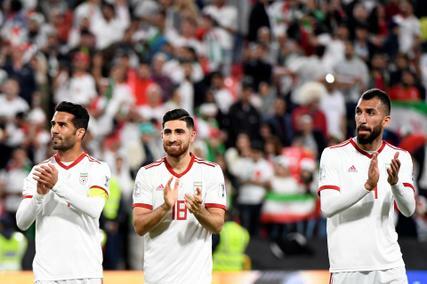 Iran sealed the three-goal win late on through Ansarifard, who made the most of a gift from China's defence to slot home from Taremi's throughball five minutes after replacing Azmoun. (90'+1) Goal! China PR 0, Iran 3. Karim Ansarifard (Iran) right footed shot from outside the box to the bottom right corner. Assisted by Mehdi Taremi. (31') - Goal! China PR 0, Iran 2. Sardar Azmoun (Iran) left footed shot from the left side of the six yard box to the bottom left corner. (18')Goal! China PR 0, Iran 1. Mehdi Taremi (Iran) right footed shot from the centre of the box to the bottom left corner. Assisted by Sardar Azmoun. Second Half ends, Qatar 1, Iraq 0. Good evening! Welcome to the Live Updates of China Vs Iran in the Asian Cup! China showed character in their round of sixteen clash to come back from a goal down with Gao Lin scoring the winner from the penalty spot with 20 minutes to go to register a 2-1 win. As for Iran, they continued their impressive showing at the Asian Cup with a routine 2-0 win over Oman. Both goals came in the first half, and Team Melli captain Ashkan Dejagah scored the decisive goal from the penalty spot. As ever, join me for all the latest build up from the big match, including team news, and Live Goals as they go in!